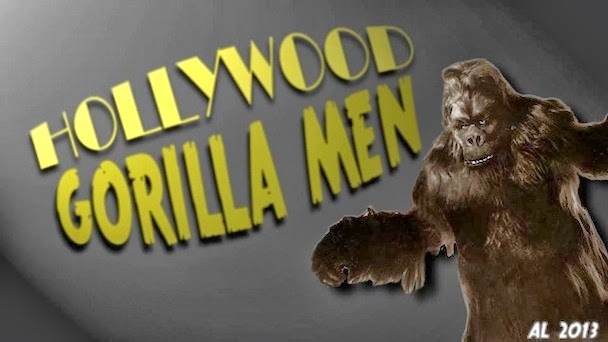 There is a strange connection between gorillas and cowboys in Hollywood. Well before cowpokes tried to rustle Mighty Joe Young (sure they were in Africa but those hired hands came straight out of the Wild West!) 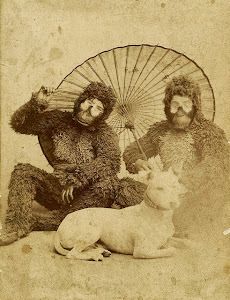 a few gorilla men had strong ties to the dusty action pictures. Climbing into a heavy, cumbersome and unbearably hot gorilla suit requires a man of sturdy stock and many western stars had backgrounds in stunt work. Ray ‘Crash’ Corrigan quickly rose to prominence in the Three Mesquiteer series during the mid 1930’s but he made regular gorilla suit appearances, perhaps more than any other gorilla man, in films stretching from 1932 to 1948. When I had begun seeking out information on Ray and his simian peers it became rapidly apparent that his career had received the greatest amount of attention both on the web and in print. Apparently there was a period of employment with the former lawman that further fueled Ray’s fascination with the Old West. After his arrival in California, Ray Benitz embraced the traditional Hollywood practice of reinventing your name, alternating between Ray Bernard and Ray Benard. Ray’s big break came at the Hollywood Gymnasium where he worked as an instructor. Brushing elbows with celluloid stars, Ray was training Delores Del Rio when he was scouted by Cedric Gibbons of MGM. His four year contract with the studio was far from a breakthrough. Ray was limited to minor roles and stunt work, though his appearance in TARZAN, THE APE MAN (1932) earned him the job of stand-in and double for Johnny Weismuller in the sequel TARZAN AND HIS MATE (1934). 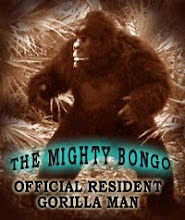 The first MGM Burrough’s adaptation also marked the first time that Ray donned a gorilla suit. 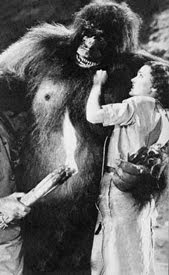 There are several suits in the film; Tarzan’s adoptive family of chimp-like apes and the monstrous gorilla of the cruel pygmy tribe. 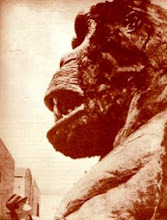 I have not come across any direct reference to what ape part Ray may have played but I have a suspicion that he may have been the giant killer gorilla. Ray was not a small man, a real oddity in the gorilla suit profession where assuming the wide legged stance and hunched position of a simian is tough on the back. When his contract expired with MGM, Ray Bernard opted not to renew it, instead signing up for a two year deal with Republic Pictures in 1936. 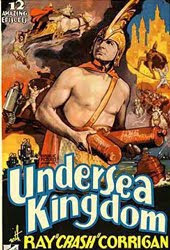 The newly invented name Ray ‘Crash’ Corrigan first appeared on the posters for UNDERSEA KINGDOM (1936), a 12 part serial that showcased his physical attributes and finally gave Ray center stage. How he came by the nickname ‘Crash’ is the subject of several tales. There are assertions it was a result of his stunt work background, sizeable physical stature or his questionable horse riding abilities but the most likely and reasonable answer is a commercial one. When Republic released the sci-fi adventure chapter play, the comic strip character Flash Gordon was a household sensation and had just been immortalized on the silver screen by Buster Crabbe. FLASH GORDON was released in the U.S. April 6, 1936; UNDERSEA KINGDOM followed 5 short weeks later on May 30 and no doubt sought to capitalize on any association with the smash hit by having the name ‘Crash’ (read FLASH!) blazing across the advertisements. By odd coincidence Ray actually appears in the Buster Crabbe serial as an alien single horned ape creature and has a thrilling grapple with the golden haired hero before succumbing to the sharp end of a spear. 1936 also saw ‘Crash’ in the first of 24 Three Mesquiteer films where he played Tucson Smith, one third of a trio of roving Western heroes. 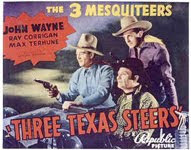 The series began with THE THREE MESQUITEERS (1936) and concluded with THE RANGE BUSTERS (1940). The cast fluctuated over the series and even included the legendary Duke, John Wayne for 8 pictures. 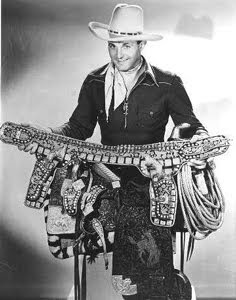 Ray’s relationship with Republic soured over their reluctance to renegotiate his price after establishing a solid Western hit. He continued to work through 1939 but the return of former costar John Livingston after John Wayne’s departure finally motivated ‘Crash’ to move on. Purchased for about 10,000 dollars, the ranch was in operation for nearly 30 years and was used in over 3500 television and film productions. 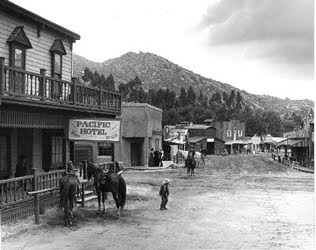 A variety of Western locales were created such as a Frontier town and a Pueblo village and the expanses of undeveloped land were perfect for cowboy flicks. Crafty Crash also envisioned one of North America’s first theme parks. With the availability of the authentic sets and a cast of expert hands and performers, Ray Corrigan welcomed the paying public to ‘Ray Corrigan Movie Ranch’ (later renamed Corriganville) on weekends when productions were closed. Staged performances wowed kids and parents alike and Western icons like Rin-tin-tin could be met in person, or rather canine. The park was sold in 1966 to Bob Hope for 3 million dollars and was subsequently renamed Hopetown. Unfortunately, fires have since destroyed the structures on the property and all that remains of the once impressive sets are weed strangled concrete pads. Efforts have been made to purchase the land and restore this unique chapter of Americana but have yet to produce tangible results. Upon a dark horse came..WHITE PONGO! !